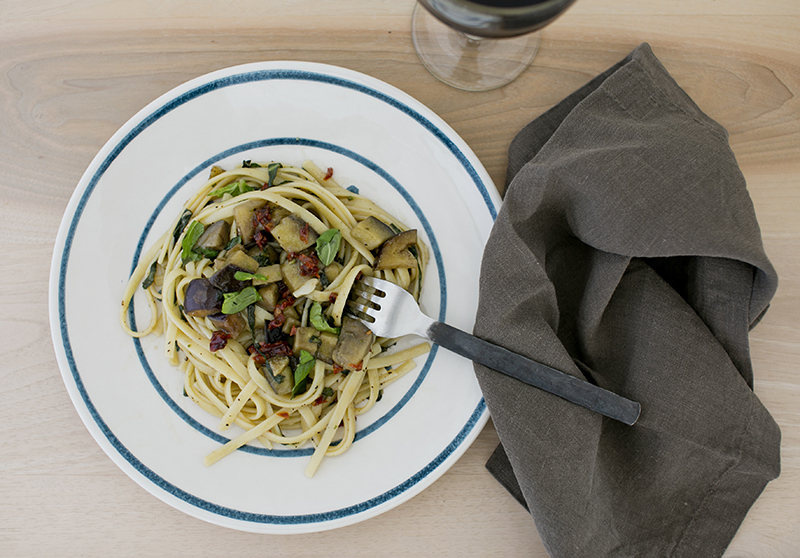 If you are feeling less carnivorous, aubergine is a satisfying substitute for meat in recipes. This pasta is equally as filling as the one with Bolognese sauce. 1. Lightly salt the sliced aubergines and stack them in a colander for 20 minutes, to neutralise any bitterness. Drain the aubergines and pat them dry with a paper towel. Cut aubergines into cubes. 2. For aubergine sauce: Meanwhile, pour the olive oil into a wide, heavy pan, add garlic and stir on a medium heat. 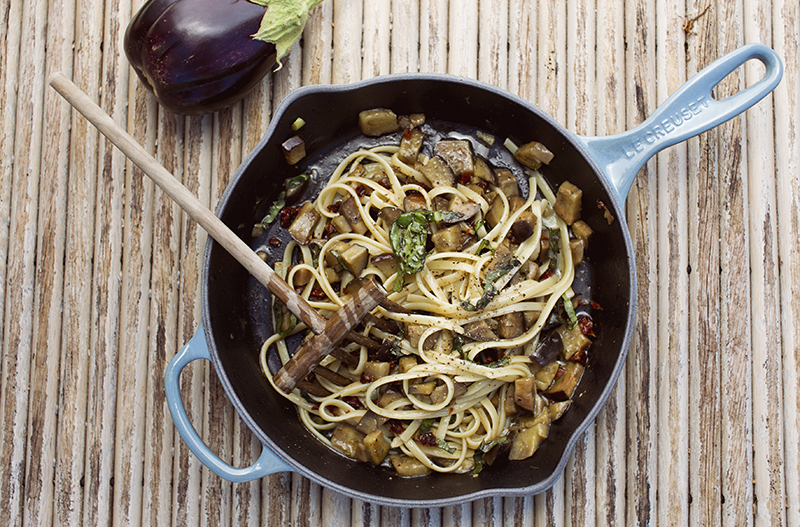 Increase the temperature to medium-high, add the aubergines and sauté. When the aubergines start to brown, add the thyme sprigs and stock and bring to a simmer. Reduce temperature to medium-low, stir once, cover and set aside. 3. Bring a large pot of salted water to a boil. 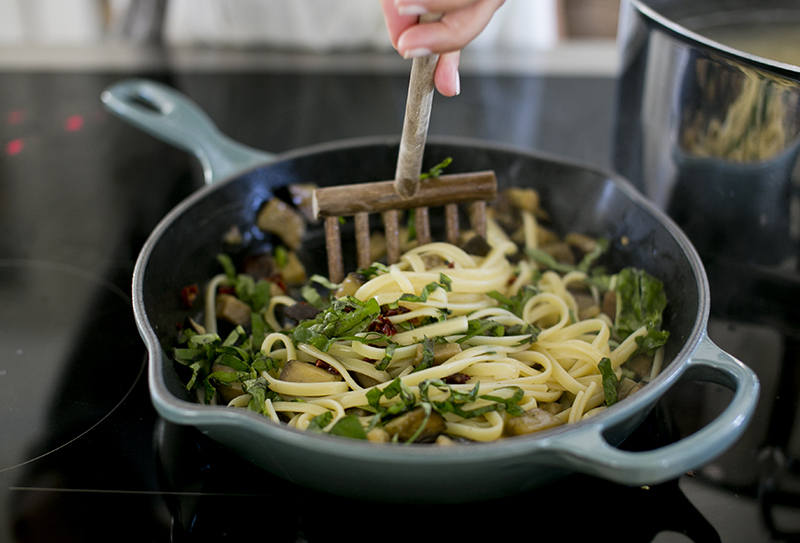 Cook pasta to al dente (2 minutes less than the packet’s instructions). Drain the pasta and add to the aubergine sauce, stirring in the sun-dried tomatoes, basil and adding a swirl of olive oil to blend. Season to taste and serve.